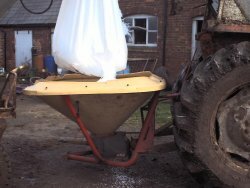 The month started dry and we spread yet more muck then it rained, froze and snowed around the middle of the month. This has slowed down the grass growth although towards the end of the month we have spread some fertilizer. 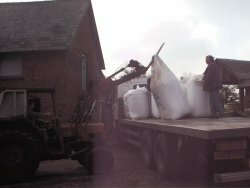 These pictures show the fertilizer being delivered and loading the sower ready to spread. The keen eyed among you will notice that the tractor being used is the scraper tractor this is currently doing 2 jobs (loader and scraper) as the loader is out of action. 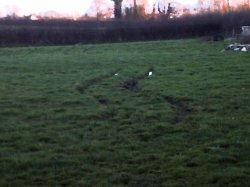 The fields as you can probably guess are still wet from all the winter's rain as you can see from these wheel ruts. (The rainfall total for the month was 36mm). 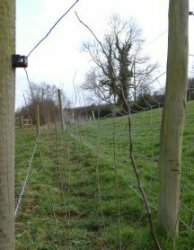 While this was going on we have finished off planting the last section of hedge along the cow drive pictured here (Paul is hoping to update this picture from the same angle to show the hedge growth). Also this month we are adding a new page to the nature trail in the form of a "Spring report" I am hoping to add to this for the next two months and then do a "summer " etc. 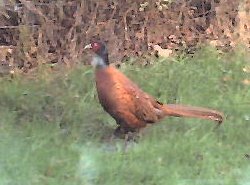 Simon started by photographing this Male Pheasant on our back lawn. If you look at the March 2000 report you will see that the cows went out at the end of the month. This year I am hoping that they will be out by the 14th of April 2 weeks later than last year! However this will increase the Foot and Mouth risk as I feel they are slightly more protected inside than out but with the silage clamp nearly empty they will have to go out. I have prepared a page about Foot and Mouth click on the link to view it. Foot and Mouth dominates the thoughts of all UK livestock farmers at present as I write this report there is a new case only 4 miles away from us here at Greenheyes. Although we have not at present got the disease the precautions are altering our lifestyle . 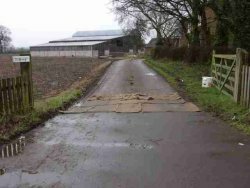 The chemical "mat" at the front gate pictured here. 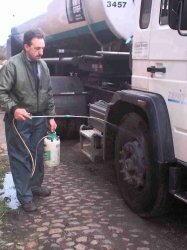 Our milk tanker driver Martin pictured here disinfecting his wagon before going on to the next farm. 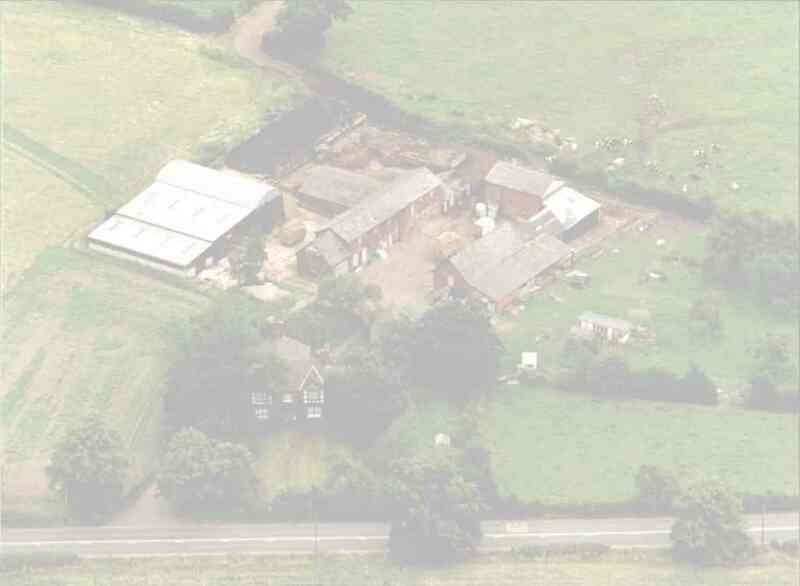 We also have not been out from the farm much apart from essential calls. Last week the cattle breeding service was suspended so because we do not have our own bull no more cows can get in calf until this is over. We have had only one calf this month a black and white heifer however we cannot send any to market as they are all shut so we currently have all the calves that were born last month as well. With 6 cows due for April we hope we can allow them to calve outside or things will get cramped. I know many teachers visit this site just imagine the oldest children in your school staying on yet you also getting the usual influx of new starters. Finally Myself , Dorothy , Simon and Sarah would like to thank all our friends for their kind support during these difficult times and also to the people who have visited us through the contacts page we REALLY appreciate it .